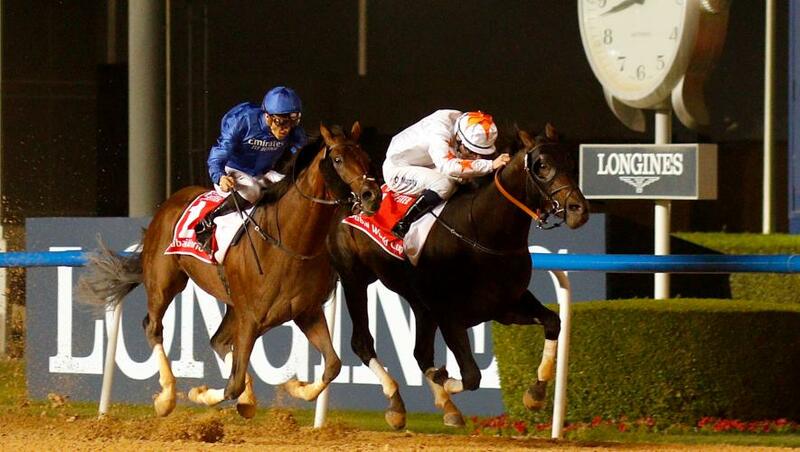 Godolphin’s Thunder Snow became the first horse to win the G1 Dubai World Cup Sponsored By Emirates twice when beating Gronkowski by a nose in a very thrilling climax to the 10-furlong dirt centrepiece of Dubai World Cup night at Meydan, UAE, on Saturday, 30 March. The five-year-old Helmet horse provided trainer Saeed bin Suroor with a ninth victory in the US$12-million race, run for the 24th time, and was a fourth Godolphin success on the evening following on from the victories of Cross Counter, Blue Point and Old Persian. Thunder Snow, with regular jockey Christophe Soumillon in the saddle, was smartly into his stride from stall 12 and tacked across to race in a close second behind North America. Gronkowski moved up to join North America at the head of the 12 runners entering the back straight, with Thunder Snow settling just behind in third on the inside rail. Christophe Soumillon switched out Thunder Snow on entering the straight with two furlongs to race and the Godolphin star ran on to regain second from North America after another half-furlong. Thunder Snow continued to make relentless headway on Gronkowski and the duo battled bravely for the lead in the closing stages, flashing past the post together, with the Godolphin runner prevailing by a nose in the photo-finish. His winning time came to 2m 3.87s. Saeed bin Surooor said: “Thunder Snow is a great horse. We gave him a break after he ran at the Breeders’ Cup and he needed the race on Super Saturday. “Most people thought that it wasn’t going to be a good enough preparation for this, but he was always travelling well tonight. “Christophe Soumillon gave the horse a great ride from stall 12 and it’s a brilliant result for Thunder Snow, for Godolphin and for Sheikh Mohammed. “It’s very rare that you find a horse who can win big G1 races on turf and dirt. Thunder Snow ran big races in America last year as well and it is brilliant to win the Dubai World Cup again. Christophe Soumillon explained: “Last year, I won by five or six lengths, but Thunder Snow had to fight hard today. “When I came in the turn, Gronkowski and North America were going better than me, so I gave Thunder Snow a chance and rode him like I did to win the UAE Derby two years ago. “I want to say a big thank you to Saeed bin Suroor and also Sheikh Mohammed because, just before the race, they said that I needed to ride with so much confidence and do everything right. Thank you to Thunder Snow, because I wouldn’t be able to do those kind of things without him. “It was very hard to get past Gronkowski and I looked more like a jump jockey than an American-style jockey but, you need to keep Thunder Snow going and sometimes you have to do something different. “Thunder Snow showed what an iron horse he is today. He has travelled all around the world, going to so many different places, and is impressive in what he is doing all the time. He never gives up and you always have to believe in him. “On a day like today, giving so much effort and with that draw, to keep fighting the whole way is something amazing. “I heard the crowd in the straight. I could hear everyone screaming very hard to make us go faster, but I was really confident in the last 50 metres.